While U.S. job market growth has exceeded expectations for July, a look back over the past year reveals a bumpy road for many metropolitan areas. Although fears that our economy will dip into a second recession have mostly subsided, unemployment continues to plague certain areas. There is progress, however. A number of metropolitan areas across the U.S. have seen substantial job market growth over the past year, the Bureau of Labor Statistics reported. 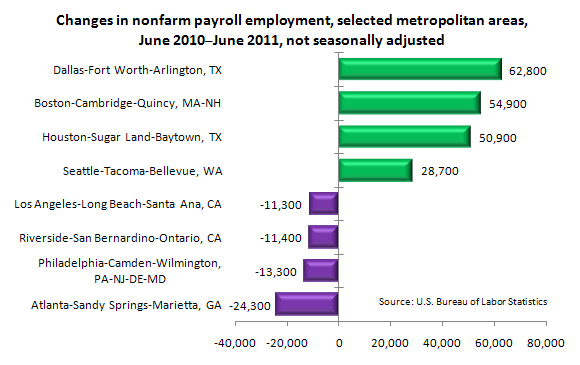 From June 2010 to June 2011, 217 metropolitan areas reported increases in non-farm payroll employment, 143 reported decreases, and 12 experienced no change. Looking back over-the-year, the metropolitan areas witnessing the largest gains in employment were Dallas-Fort Worth-Arlington, Texas with +62,800, followed closely by Boston-Cambridge-Quincy, Massachusetts-New Hampshire with +54,900. Houston-Sugar Land-Baytown, Texas saw +50,900 additional positions, and Seattle-Tacoma-Bellevue, Washington gained +28,700. Other metropolitan areas were less fortunate – significant job loss drained Atlanta-Sandy Springs-Marietta, Georgia with a decrease of -24,300 positions. Philadelphia-Camden-Wilmington, Pennsylvania-New Jersey-Delaware-Maryland lost ?13,300. While Riverside-San Bernardino-Ontario, California lost ?11,400, Los Angeles-Long Beach-Santa Ana, California was close by with a loss of ?11,300. Overall, the data suggests largely positive results. “Over the year, nonfarm employment rose in 24 of the 36 metropolitan areas with annual average employment levels above 750,000 in 2010. The largest over-the-year percentage increases in employment in these large metropolitan areas were posted in Milwaukee-Waukesha-West Allis, Wis. (+2.7 percent), Boston-Cambridge-Quincy, Mass.-N.H., and Dallas-Fort Worth-Arlington, Texas (+2.2 percent each), and Houston-Sugar Land-Baytown, Texas (+2.0 percent). The largest over-the-year percentage decreases in employment occurred in Atlanta-Sandy Springs-Marietta, Ga. (-1.1 percent), Indianapolis-Carmel, Ind., and Riverside-San Bernardino-Ontario, Calif. (-1.0 percent each), and Baltimore-Towson, Md. (-0.8 percent),” the B.L.S. stated.